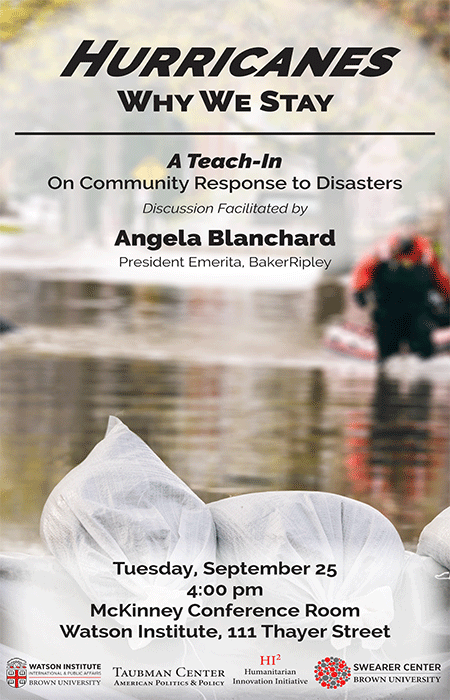 A teach-in for students on community response to disasters. Facilitated by Angela Blanchard, President Emerita, BakerRipley. Few of us will grow old without facing a storm of some kind in our lives. We watch as literal storms drown and burn communities. Pressing questions and life and death decisions must be made by officials. But what about the choices individuals are forced to make. Whether to stay or go. When to stay or go. What to save. What to leave. And then what to rebuild and what to abandon once the water recedes. If you’d like to share what you know about tough decisions and weathering storms join us. If you’d like to gain insights into the factors that shape the choices we make in disaster arenas - come and join us. Angela Blanchard, President Emerita of BakerRipley, is a globally recognized expert practitioner in community development, disaster recovery, and effective long-term integration for immigrants and refugees. Blanchard’s breakthrough strategies have successfully revitalized neighborhoods by leveraging Houston’s diversity, while providing a powerful model for cities across the globe facing the complex challenges of community transformation. Under Blanchard’s leadership for more than 30 years, BakerRipley became the largest community development organization in Texas and among the top 1% of charitable groups nationwide. It currently serves more than half-a-million people in 48 counties and operates with an annual budget of $250 million. Cosponsored by the Watson Institute, the Humanitarian Innovation Initiative, the Taubman Center for American Politics and Policy, and the Swearer Center.